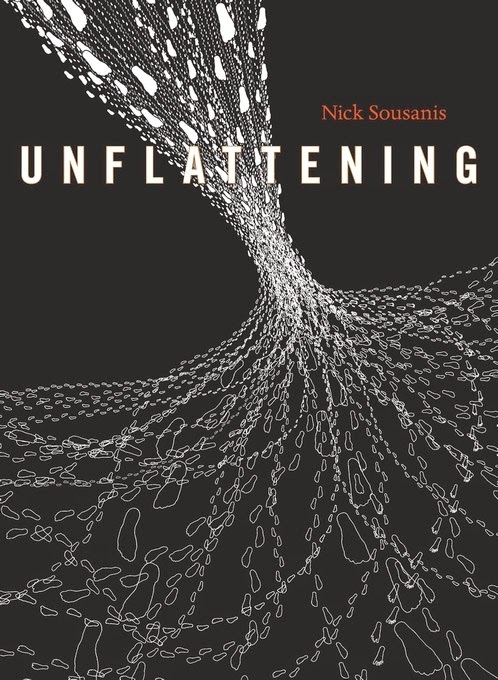 Nick Sousanis’ recent book Unflattening has been receiving praise for its freeing message and artistic execution. The book was Sousanis’ doctoral dissertation, and in being a graphic work, it thus embodies its message of attempting to break through the confines of the "flatlands" of received viewpoints that unconsciously pervade the ways we see the world. This advocacy specifically targets the hegemony of words, with the freeing power of images—particularly through “comics." In these regards, the book deserves all the praise it has received. The message is a good one, and the execution is wonderful and sensory. It is a pleasure to read, and nicely balances the artistic and expository, accessible and academic. Clearly, Sousanis knows his craft and carries it out effectively. It also succeeds quite well as just an example of graphic non-fiction, especially without relying on a "narrator character" like McCloud (and others...me included). For these reasons alone the book is worth reading. For me, the book resonated with my personal experience, but in doing so also betrayed some limitations to its own core message by upholding its own flatlands throughout. I'll spend the rest of this review focusing on these. The book's advocacy to look beyond the limited viewpoints that one holds both unconsciously and unaware is a great message. In truth, at many times I felt it was speaking directly about my work: In attempting to teach about the theory of visual language, I often feel like Sousanis' referenced example of the sphere telling squares that there is something beyond the flat 2D world as they understand it. As stated in the introduction to my book, I offer an alternative view of the world related to language, drawing, and “comics", and am trying to teach others to see through my eyes. For example, I cringe whenever I hear someone summarize that I believe “comics are a language,” because it is the exact opposite of what I actually believe. And, it shows that they did not fully understand the alternative viewpoint I offer, but rather pushed my spherical message into the square holes they already held. First, despite arguing for an interdependence between text and image in their expressive capacities, I found it ironic that only until late in the book does text not lead this dance, and not for long. The images throughout are certainly not negligible, but they mostly enhance, supplement, and enrich the message beyond what text could serve on its own. The text still provides the primary weight of meaning throughout. Rarely are there comprehensible portions of images where the text could be omitted entirely, but the same does not seem to be said for the text (at least, not until the last three chapters). However, I would expect this from a more expository and academic work like this, so it's less of a criticism than an observation. Comics "is" a medium that transcends cultural boundaries, historical periods, etc. While language is a channel that constrains thought, drawings are freeing, because they encroach on “perception.” Drawings thus get closer to actual pure thought in a unique and individualized way that is not constrained by the memorized patterns of language. These are the standard perspectives upheld throughout most theories of “comics” and “visual communication,” and Sousanis’ references support these views. Drawings are not a siphon for our perception, they reflect entrenched and learned cognitive patterns stored in our memories just as much as language, because they are built just like language. For example, drawing is not about re-presenting perception, but about learning and producing patterned graphic schemas in order to express our concepts. If you don't learn enough patterns, you won't draw proficiently. This makes drawing less like perception, and more like language: both involve stored information in memory. As I argue in my paper “Framing ‘I can’t draw,’” the assumptions about "drawing as tied to perception" actually limit people’s ability to learn to draw, and thereby limit their ability to carry out the mission Sousanis advocates. Along these lines, Sousanis nicely evokes Lakoff and Johnson’s ideas of conceptual metaphor and Fauconnier and Turner’s ideas of conceptual blending in language. Yet, he does not mention that drawings also use these same conceptualizations (see for example work by Forceville, who will have a summary chapter in my upcoming book). Furthermore, contrary to the received wisdom, I argue that "comics" "is" not a medium, but rather "comics" are a social construct in which we use two methods of communication: writing (a convergence of spoken language into the visual) and drawing (natural visual language). The union of these things is not “comics” but is our default capacity for multimodal expression, which often happens to appear in a social construct we call “comics”—but not always. As Horrocks’ pointed out, McCloud and others conflated the notion of (sequential) drawing and/or writing into being "comics", a definition constrained by their own flatlands. Whether you buy into my theories or not, by collapsing these independent but intertwined facets of expression (writing, drawing) into a single construct (“comics”), Sousanis betrays his own mission of attempting to break apart limiting conceptualizations. As a unified thing tied to its stereotypes, it becomes constrained, rather than freed by the unlimited potential of just writing and drawing unbound to such a social construct. Thus, overall I do recommend the book and wholeheartedly agree with Sousanis’s messages, especially for using text (written/spoken language) and image (visual language) in concert. Indeed I would go further to say that this is our default cognitive human orientation for expression (plus gesture/sign language). However, in its framing of this position, Unflattening retains its own “flatland” that is strived to be overcome, which perhaps in part further speaks to the overall message that escaping one’s frames of knowledge is harder than we might realize. Do you think silent comics (comics without words) can be a visual language? Thanks for your comment Julian, and for reading my book! In fact, I address this question on page 2 of my book, where I say "COMICS ARE NOT A LANGUAGE"
"Comics" is not a synonym for "visual language." Systematic drawings that share a visual vocabulary, especially those in wordless sequences, constitute visual languages. These visual languages often combine with written language in "comics." This is the same relationship as written language to novels (or newspapers or magazines or any other "format"). We don't say that novels ARE written language and then wonder if the same is true if that novel has illustrations. Comics are written in visual languages, often combined with written language. Equating the social context to the language ("comics=VL") misses this crucial distinction.